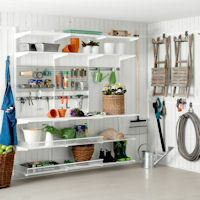 We can help organise your workshop, garage or utility room with our new range of Swedish made Elfa Garage storage. 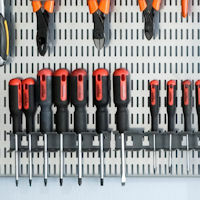 Used alone or within a wider Elfa shelving project, our tool storage hooks, parts storage bins and hangers will keep your workshop looking as organised as any professional garage. Our neat new Elfa Garage storage system is great for utility rooms too making clever use of space for mops, brushes and ironing boards etc. 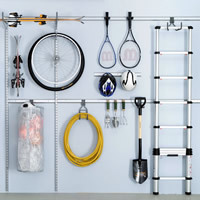 Our customers also suggest using it for sports gear and garden tools etc. 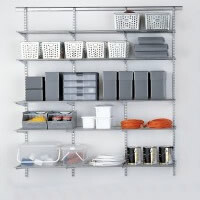 and as usual with Elfa, everything is compatible with our modular standard Elfa shelving. Use to mount your Elfa Craft or Tool Board to the Wall. Offers a neat tailored look and allows the board to be easily removed for reconfiguring etc. 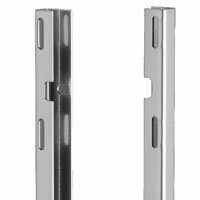 Pair of hooks to clip your elfa utility top track securely between two elfa wall bars in your wider elfa shelving solution. 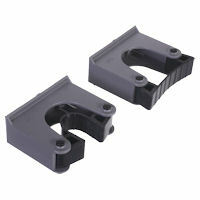 This pair of moveable flexible holders securely yet gently grip and hold onto items placed in their jaws. Great for tennis rackets, torches, cricket bats, mops and brooms. 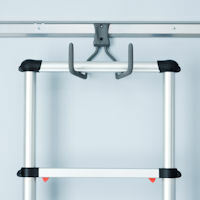 Non-slip deep double hook to store a ladder, ironing board, step stool etc. 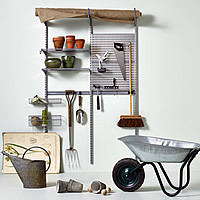 Declutter your potting shed or garage with this neat space saving hooks, hangers and shelving solution from elfa. FREE Design Service Available if this size is wrong for your available space! 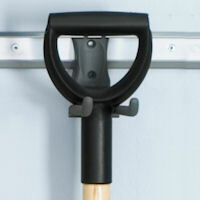 At 24.5cm deep, this elfa storage hook is ideal for storing 2 or 3 spades, forks, shovels, brooms and garden rakes etc. 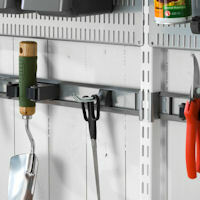 Simply clip onto an elfa top track to store garden hand tools and other small tools. 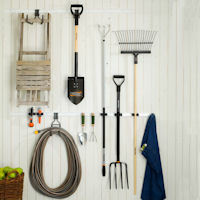 Organise your garage or shed with our elfa utility starter pack of movable and modular hooks and hangers. 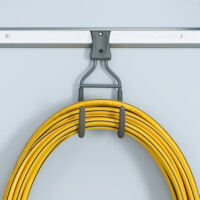 Non-slip rounded storage hook to store garden hoses, golf bags, extension leads, rope etc. 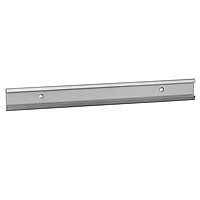 Snap this pair of posts onto a standard 40cm elfa shelf bracket to safely and securely store planks of wood, skis and surf boards. 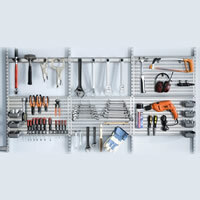 Our no.1 elfa garage shelving solution might actually allow you the luxury of fitting the car in the garage! 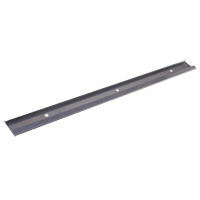 It has five rows of 40cm deep heavy duty ventilated elfa shelving and only requires 7 screws to fix to the wall! 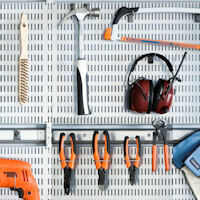 A handy selection of hooks and hangers alongside four elfa tool boards to help declutter your garage work space. 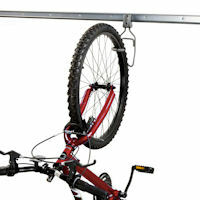 Securely hold a bike by it's front or back wheel to the wall. 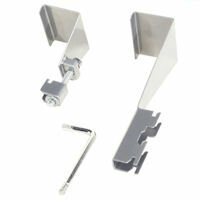 Can be screwed directly to the wall or used with an elfa top track to clip several bikes next to each other. Sturdy Swedish-made steel tool board. 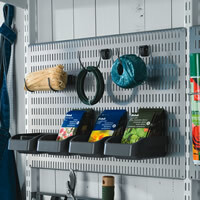 Simply clip-on our our amazing range of elfa tool holders, hooks and storage boxes for a perfect shed or garage storage solution. 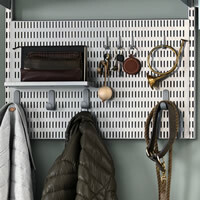 Sturdy Swedish-made steel tool board to hold our amazing range of elfa tool holders and storage boxes. 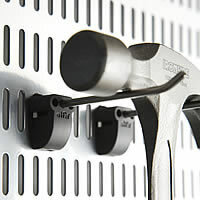 Set of 4 long (65mm) hooks to simply clip onto an elfa tool board to store brushes, scissors, pliers, hammers etc. Set of 5 short (35mm) hooks to simply clip onto an elfa tool board to store brushes, scissors, pliers, hammers etc. 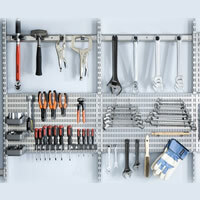 Store up to eight spanners, files, wrenches etc. 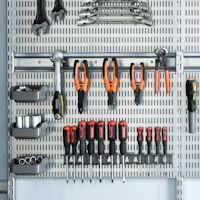 in this neat spanner store designed to clip onto our elfa tool board. 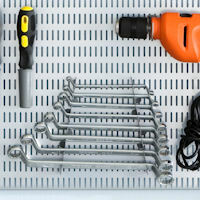 Handy storage tray at a great price to store screws, nails nuts and bolts etc. Use with our elfa tool board. 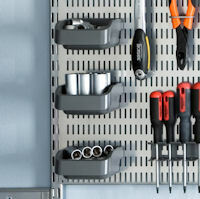 Clip our file and screwdriver store onto your elfa tool board to store up to six screwdrivers, files etc. at a time. 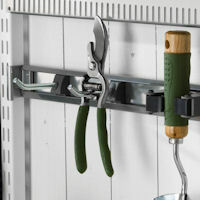 Declutter your potting shed or garage with this neat space saving hooks, hangers and shelving solution from elfa. 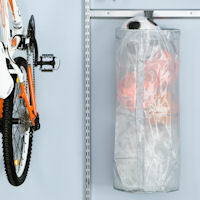 A great addition to the elfa range to allow storage on the back of a door without the need for drilling.